The campaign’s goal was to assure Justice Anthony Kennedy that his judicial legacy would be in good hands should he decide to step down at the end of the court’s term. WASHINGTON — President Donald Trump singled him out for praise even while attacking other members of the Supreme Court. He nominated people close to him to important judicial posts. And members of the Trump family forged personal connections. Their goal was to assure Justice Anthony Kennedy that his judicial legacy would be in good hands should he step down at the end of the court’s term that ended this week, as he was rumored to be considering. Allies of the White House were more blunt, warning the 81-year-old justice that time was of the essence. There was no telling, they said, what would happen if Democrats gained control of the Senate after the November elections and had the power to block the president’s choice as his successor. 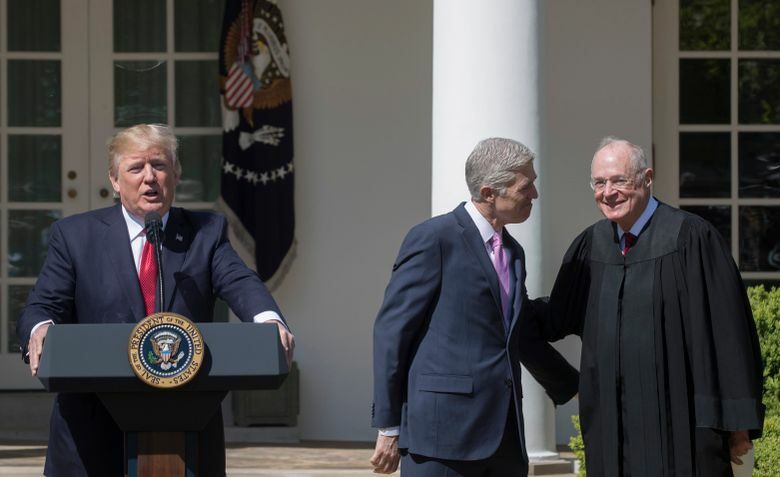 There were no direct efforts to pressure or lobby Kennedy to announce his resignation Wednesday, and it was hardly the first time a president had done his best to create a court opening. “In the past half-century, presidents have repeatedly been dying to take advantage of timely vacancies,” said Laura Kalman, a historian at the University of California, Santa Barbara. But in subtle and not so subtle ways, the Trump administration waged a quiet campaign to ensure that the president had a second opportunity in his administration’s first 18 months to fulfill one of his most important campaign promises to his conservative followers: that he would change the complexion and direction of the Supreme Court. When Trump took office last year, he already had a Supreme Court vacancy to fill, the one created by the 2016 death of Justice Antonin Scalia. But Trump dearly wanted a second vacancy, one that could transform the court for a generation or more. So he used the first opening to help create the second one. He picked Justice Neil Gorsuch, who had served as a law clerk to Kennedy, to fill Scalia’s seat. Trump himself said he wanted to appoint justices who would overrule Roe v. Wade, the 1973 decision establishing a constitutional right to abortion. Kennedy has voted to reaffirm Roe’s core holding. And Trump has not hesitated to criticize far more conservative members of the Supreme Court, notably Chief Justice John Roberts. “Justice Roberts turned out to be an absolute disaster, he turned out to be an absolute disaster because he gave us Obamacare,” Trump said in 2016, presumably referring to Roberts’ votes to sustain President Barack Obama’s health-care law. There is reason to think, then, that Trump’s praise of Kennedy was strategic. After Gorsuch’s nomination was announced, an administration official singled out two candidates for the next Supreme Court vacancy: Judge Brett Kavanaugh of the U.S. Court of Appeals for the District of Columbia Circuit and Judge Raymond Kethledge of the 6th U.S. Circuit Court of Appeals, in Cincinnati. The two judges had something in common: They had both clerked for Kennedy. As the administration turned to stocking the lower courts, it did not overlook Kennedy’s clerks. Trump nominated three of them to federal appeals courts: Judges Stephanos Bibas and Michael Scudder, both of whom have been confirmed, and Eric Murphy, the Ohio solicitor general, whom Trump nominated to the 6th Circuit this month. One person who knows both men remarked on the affinity between Trump and Kennedy, which is not obvious at first glance. Kennedy is bookish and abstract, while Trump is earthy and direct. But they had a connection, one Trump was quick to note after his first address to Congress in February 2017. As he made his way out of the chamber, Trump paused to chat with the justice. Trump was apparently referring to Kennedy’s son, Justin. The younger Kennedy spent more than a decade at Deutsche Bank, eventually rising to become the bank’s global head of real-estate capital markets, and he worked closely with Trump when he was a real-estate developer, according to two people with knowledge of his role. During Kennedy’s tenure, Deutsche Bank became Trump’s most important lender, dispensing well over $1 billion in loans to him for the renovation and construction of skyscrapers in New York and Chicago at a time other mainstream banks were wary of doing business with him because of his troubled business history. If the overtures to Kennedy from the White House were subtle, the warnings from its allies were blunt. Last month, Sen. Chuck Grassley, R-Iowa, chairman of the Senate Judiciary Committee, went on Hugh Hewitt’s radio program to issue an urgent plea. Intermediaries pressed the point with Kennedy privately, telling him Donald McGahn II, Trump’s White House counsel, would likely leave after the midterms. McGahn has been a key architect of Trump’s successful efforts to appoint conservative judges, they said, and his absence would complicate a Supreme Court confirmation. There is nothing unusual in urging older justices to retire for partisan reasons. During the Obama administration, prominent liberals called for Justice Ruth Bader Ginsburg to retire so that Obama could name her successor. Kennedy’s departure is a triumph for Trump, who has taken particular satisfaction in his judicial appointments. Naming justices and judges is easier than forging legislative compromises, and Trump understands that his judicial appointments represent a legacy that will long outlast his presidency. Replacing Scalia with another conservative did not alter the basic ideological balance of the court. But replacing Kennedy, who for decades held the decisive vote in many of the court’s closely divided cases, would give Trump the opportunity to move the court sharply to the right.